Republican Gov. 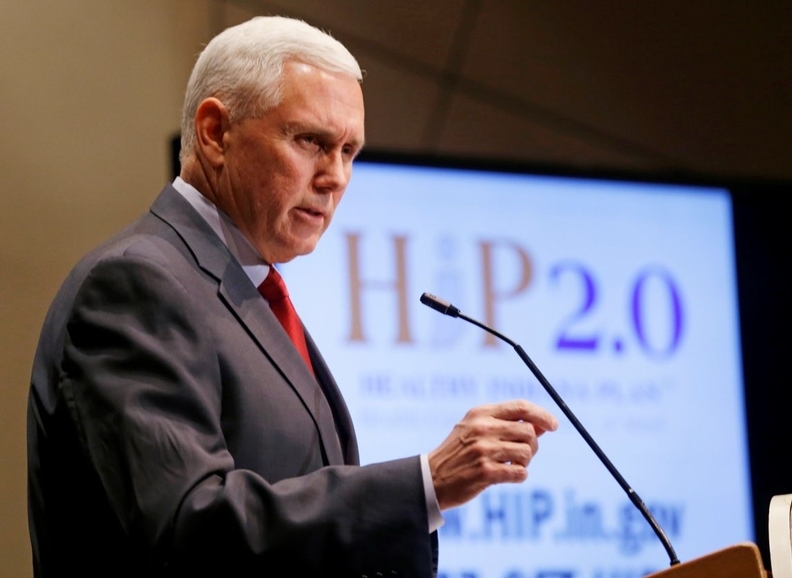 Mike Pence secured a CMS waiver allowing Indiana to require cost-sharing in its expanded Medicaid program. Three states that require low-income adults to pay premiums or other cost-sharing to participate in their Medicaid expansion programs have collected modest sums so far. As part of their Medicaid expansion programs Arkansas, Indiana, Iowa and Michigan each received time-limited Medicaid waivers from the Obama administration impose cost sharing in the form of premiums, copays, or both. Arizona and Ohio, which launched their Medicaid expansion programs without cost sharing, now plan to submit similar waiver requests to the CMS. Montana, which recently approved expansion, also is seeking such a waiver. Making low-income adults pay part of the cost of their coverage and care helped convince Republican elected officials in those states to approve the Medicaid expansion for adults with incomes up to 138% of the federal poverty level, which is optional under the Affordable Care Act. Supporters say making beneficiaries pay gives them more “skin in the game” and leads them to take better care of their health and use healthcare services more appropriately and thriftily. Politically, imposing cost-sharing helps counter arguments from conservative Republicans that able-bodied adults should not receive government-paid coverage and instead should find jobs that provide coverage. But studies show that most people who are eligible for expanded Medicaid coverage either are employed or are part of working households. Critics, backed by a number of studies, warn that imposing cost-sharing on Medicaid beneficiaries discourages people from signing up for coverage and from seeking needed care, which some proponents of cost-sharing have acknowledged. Other critics have predicted that states and healthcare providers would find it expensive and administratively cumbersome to extract premium and other cost-sharing payments from poor people. From a purely income-generating perspective, the cost-sharing policies have led to modest collections so far in Michigan, Iowa, and Arkansas. These states have the longest experience in using cost sharing in their expanded Medicaid programs. In Michigan, 600,000 people have gained access to coverage as part of the state's expansion, and the state collected $737,000 in monthly premiums from November 2014 to April 2015. The CMS gave Michigan permission to impose premiums only on beneficiaries with incomes between 100% and 138% of poverty, while most people who received coverage under the expansion have incomes below the poverty level. Under the state's Healthy Michigan program, beneficiaries pay up to 2% of their income for premiums. In Iowa, the state has collected in $142,000 from 15,000 beneficiaries to date. The rest of the people eligible to pay premiums completed the necessary healthy behaviors to avoid the premiums or else claimed financial hardship and didn't have to pay. The state's waiver allows it to charge a monthly premium of $10 a month for enrollees above 100% of poverty. For people with incomes from 50% to 100% of poverty, the state can charge them $5 a month after they've been in the program for one year. In Arkansas, 190,000 low-income adults have received coverage under the state's expansion. Starting in January, enrollees with incomes as low as 50% of poverty had to make monthly contributions to “independence accounts” from funds are drawn to cover premiums and copays. Monthly contributions range from $10 to $25 a month for people with incomes from 100% to 138% of poverty; for people under the poverty level, contributions are $5 a month. To date, $147,000 has been collected. In Iowa and Michigan, the amount of required premiums is tied to beneficiaries' participation in healthy behaviors' programs. In Iowa, more than 18,000 people were exempt from paying premiums after completing healthy behaviors including getting an annual physical and completing a health risk assessment. In Michigan, 5,742 Medicaid beneficiaries completed the necessary healthy behaviors and got their monthly contributions reduced by 50%. If these Michigan beneficiaries again complete the health behaviors in the second year, they would get their contributions completely waived. Tim Albrecht, an Iowa-based Republican strategist with Redwave Digital, said the health behaviors incentives are a good idea. “This saves taxpayers money because there isn't the cost associated with treating a chronic illness down the line," he said. There are no definitive data yet on what percentage of the Medicaid expansion population in Michigan, Iowa, and Arkansas who were supposed to be paying premiums are actually doing so, due to continuous enrollment and the phased-in launch of the cost-sharing requirements. There also are no data yet on how many beneficiaries have been kicked out of Medicaid for failure to pay premiums in states such as Indiana that received approval from the Obama administration for such lock-out provisions. Some healthcare provider groups say they have not seen patients skimping on needed care such as medications or medical visits due to cost sharing requirements, though no studies of this have been done so far. “Many of the patients have not had access to health coverage for years, so they are excited to finally have coverage and the ability to afford their medications,” said Katie Owens, communications program manager for the Iowa Primary Care Association, which represents the state's community health centers. If Iowa beneficiaries can't afford the premium contribution, they can claim financial hardship on their monthly premium statement and get the contribution waived. About 5,000 Medicaid beneficiaries in Iowa have been granted hardship exemptions, according to Amy McCoy, a spokeswoman from the Iowa Department of Human Services. Julie Tatko, enabling services director at the Michigan Primary Care Association, said her group also has not seen evidence that cost-sharing requirements have created barriers to care. She said that's mainly because co-pays and cost-sharing contributions are paid out of the beneficiary's health savings account after the services have been provided.